This spectacular late 19th-century Canadian masterpiece which has never before been offered for sale has all the hallmarks of a John P. Klempp piece of furniture. The celebrated German cabinetmaker (1857-1914) lived in the Village of Neustadt in Grey County, Ontario and was well-known known for his exceptional wardrobes, chests, desks, cupboards and even picture frames. And yet family provenance suggests this piece may not have been Klempp’s own handiwork, but the work of a skilled apprentice, possibly a relative, according to someone from within the family that has owned it for close to 150 years. Interestingly, its exact mate is shown in Howard Pain’s book The Heritage of Upper Canadian Furniture, plate 1030. Pain calls it a Hanover area piece, but the maker is unidentified. It’s believed the cupboard in this sale may have been made by a grandmother’s “Uncle Chris”. This uncle was Christian Klein, born in Carrick Township, Bruce County in 1858 – a year after Klempp. Klein was in fact listed as a carpenter on both the 1911 and 1921 census but it’s possible he may have made the cupboard in his younger years. Intriguingly, the cupboard in Pain’s book bears the inlaid initials KL under the birds in the nest. Could those initials represent the KL in Klein? Regardless, Klein was a carpenter, as well as a contemporary of Klempp’s. This kleiderschrank, or ‘schrank’, was designed and made in four separate pieces held together by wooden pegs. Known as the ‘knock-down’ style, its construction facilitated easy disassembly and reassembly when it had to be moved. Meticulously made of finely-polished cherry and butternut, it is decorated with intricate geometric inlay work in walnut and maple. Inside the cupboards are racks for hanging clothes. There are two carved moustache pulls on the drawers and inset between them is a tulip, a traditional folk motif. It’s a statuesque piece, standing 224 cm tall and 183 cm wide (7.3 by 6 feet). Unaware of its value, the family who owned it had been storing it in the laundry room, using it for surplus table linens and cutlery. According to consignor Shirley Weiler, of St. Agatha, Ontario, she once caught her aunt with two fresh gallons of paint. “What’s that for?” she asked, to which her aunt replied, “I’m going to paint the wardrobe.” Needless to say, it never happened. Instead, the aunt painted every window in the house shut. Thankfully, the shrank remains unrestored, with untouched original varnish. How this cupboard came to Miller & Miller Auctions Ltd. is another story. Back in 2007, Shirley sent a photo of the cupboard to appraiser John Sewell, who writes a syndicated newspaper column about antiques and fine art. 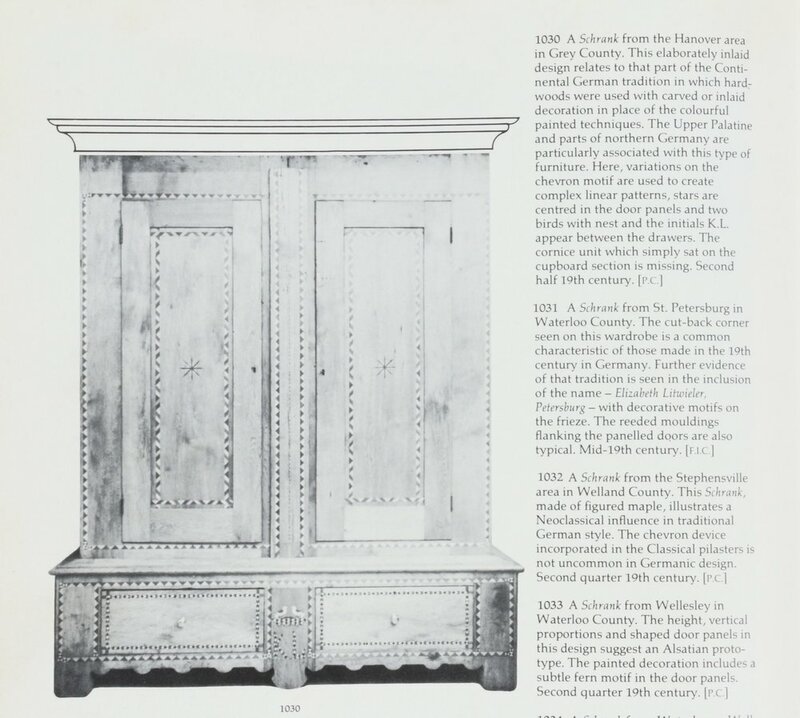 Mr. Sewell called it “a rare, top-quality piece of Canadian furniture”, noting it was “remarkably similar” to the work of John Klempp. After seeing Mr. Sewell’s column, the late Jim Miller – founder of the internationally renowned J.C. Miller Antiques in 1977, decided to go see it for himself. Shirley was happy to show the cupboard to Jim, who was even more impressed in person by the extraordinary workmanship. While Shirley had no interest in selling the cupboard back then, she promised she’d keep him in mind if that ever changed. Jim Miller passed away in 2010 and by 2018 Shirley’s health had begun to falter. “There was no question who I wanted the piece to pass on to,” she says. By that time, Jim’s sons, Ethan and Justin Miller, had launched Miller & Miller Auctions Inc. They were also running their father’s antique store in Baden, Ontario, but had disconnected the shop’s landline, deciding instead to rely on their cellphones. Then they changed their minds about the phone line. After finding out the old shop number was still available they arranged to have it reconnected. In a meant-to-be happenstance, three weeks later Shirley Weiler called that old number, the one Jim had given her in 2007, and offered his sons the family kleiderschrank. Ethan and Justin Miller are proud to be representing the Weiler family and they are honoured to be selling this exceptional piece of Canadian furniture – a piece that made such an indelible impression on their late father more than a decade ago.